Fall is the best time to plant and perhaps you are thinking about adding something to your landscape that appeals to birds and wildlife. Fantastic! Adding plants is a great way to attract birds of all kinds but especially those that do not regularly visit seed feeders. I’m referring to the small tropical birds known as Warblers. This diverse and beautiful group of birds goes unnoticed by many backyard birders because their yards don’t have the habitat appeal necessary to pull them in. 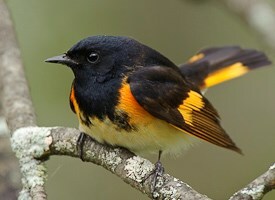 Each spring Warblers migrate into and through TN on the way to their breeding destination. As they travel they are searching for food, water, and suitable, safe resting areas. Native trees and shrubs are critical to attracting birds of all kinds and especially warblers. Native plants attract native insects, an important food source to migrating birds. In spring when leaves are first opening the first caterpillars begin hatching which is an abundant and important food source for all migrating birds. In early fall native trees and shrubs are producing fruit that will help fuel their migration back to the tropics. The fruit also attracts native insects which then become an important source of protein. You can’t go wrong planting natives because they are, typically, less susceptible to disease and insect problems. …and there are so many more great plants to choose from. But Warblers need water, too, and from my experience water is the x factor. It is probably that my water source is very easy to see from in my home that I have seen more Warbler species there than anywhere else in my yard. Bubbling, moving water is much more appealing than the standard pedestal type birdbath. Keep the water moving in some way and birds will be drawn. There are drippers and misters that run on water pressure provided by a standard outside faucet, and waterfall rocks powered by an electric pump that are quite effective at keeping water moving. I recently hung a plastic jug with a pin hole above a standard pedestal birdbath. When filled with water the jug will provide a steady drip for a few hours at a time. The dripping and subsequent rippling effect is absolutely more appealing than a still source of water. So, if making your yard more appealing to birds is on your mind think about native plants and water. It is a combination that most definitely works.